So, it's 3:30 AM. I stayed up late playing The Raven, which is kinda buggy and slow at times but engaging once you get past those things. Totally did not expect that ending, but I've actually had that thought a lot of times in the past. Generally during my low periods, though, and I've never taken steps to carry it out. I remember talking to Kyle about it some time ago, I think when I was at St. John's. I was really depressed at the time and trying to think up ways to end my existence without inconveniencing anyone or doing any harm, and I talked about gradually cutting off contact with everybody who knew me and then going out into the middle of the ocean on a raft and shooting myself off the side. 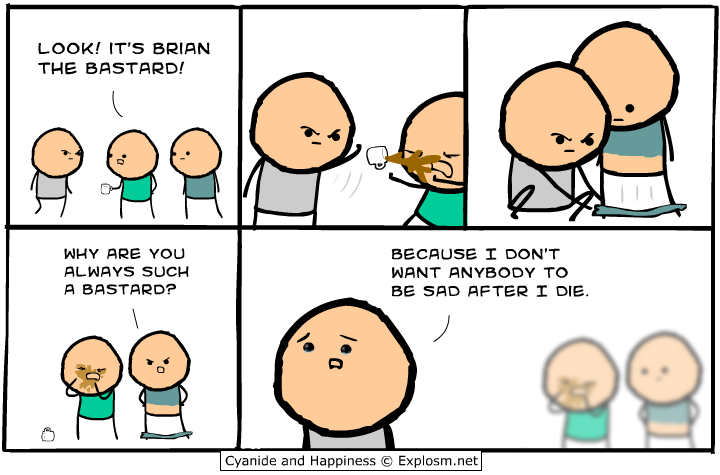 Just a depressive fantasy, and a bit further than the comic takes it, but still. I guess it's one of those things you don't really expect other people to think of too, even though when it comes down to it, I think we rarely have any truly original ideas. Anyway I'm much happier now and I don't think about this sort of thing so much anymore. Was just surprised to get a blast from the past like that. I read today's Bobbins and it used the word 'dilettante', which I've seen before but never bothered to actually look up (I don't look up words as much as I should... I usually just infer from context, sometimes incorrectly!). If you're too lazy to look it up yourself, Merriam Webster defines it as "a person whose interest in an art or in an area of knowledge is not very deep or serious." A dabbler. An amateur. Well, there's this chocolate company called Dilettante Chocolates, and I've actually seen their products in the Seattle airport (There's a cafe in the terminal I'm usually in that stocks Dilettante chocolate). Knowing the definition of the word now though, I wonder why they'd name their company that. It seems like a terrible name choice if you want to convey quality. I mean, it's not too far off from naming your company something like "Amateur Pizza" or "Not Fully Committed Sandwiches" right? In any case looking at the website is Dilettante Chocolates is making me want chocolate and I should probably go to bed before I get the desire to munch on something. My internship supervisor made me go home early from the weekly meeting today because I was coughing and she didn't want to get sick. Not particularly disappointed about that. I thought it would be good if I showed up to let her know I'm committed, but I was also kind of hoping she wouldn't make me stay the whole time, so it worked out. Since I had nothing to do after that, I went to a Japanese market nearby and picked up a Vitamin C.C. Lemon soda. They didn't have the 140mL little bottle I usually like to get, so I got the 500mL large size, but... more of a good thing, I guess? I'm going to be participating in another study on the 17th, so that should be fun. $50 for 1.5-2 hours, whee. And I'm supposed to run a 5k this weekend... D: I realllllllllly hope I'm well by then. I tried playing Until I Have You but I think it's a bit too hard for me... and it requires fast reflexes, which I'm not a huge fan of in games. It seems like it would be more fun to watch someone play than to actually play myself. I also played some other "games" that were really just... interactive vignette experiences, and I feel a little sad as a result. There was one in which you walk around a room filled with people, and some of the people are grey and some are colorful, and if you look closely at the colorful ones you can see through them and into scenes where two people are doing things together. It was called "Happy Memories". In another vignette, "Having Said Goodbye", you control a character that takes slow heavy steps until it reaches a set of stairs in front of a building, at which point it sits down and puts its head in its hands. In the last vignette I played through, "Cooking, For Lovers", you go through the steps of preparing one instant cup of noodles and then pick it up, sit on the floor, and stare at the rest of the room. They were very sparse "games", but they told a sad story, and it was moving, I guess. These kinds of things touch me, but I feel like that's due in large part to the fact that I allow them to, now. Being open to emotional experiences means being vulnerable and risking embarrassment but I guess I'm okay with that at this point in my life. It's good to feel. I don't ever want to forget that again. 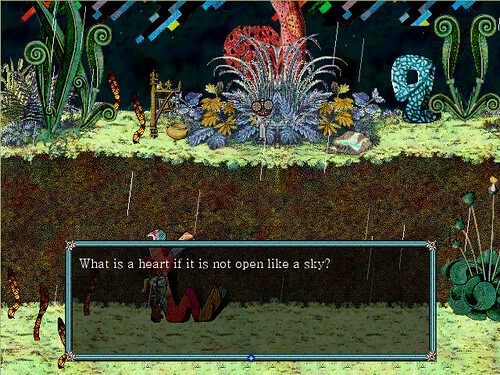 It makes me think of this, from Middens, which I've posted before and which I still think about from time to time. So I've kind of lost my voice from being sick. Virtually every other word I say comes out kind of whispery, and everything else just sounds hoarse and quiet. I went out for food with Fro, Vicky, and Sean today, and Frosan said I sounded cute. She also gave me a Christmas gift... a t-shirt with a picture of a kitten and text that says "i will end u." School starts tomorrow! I hope I feel more or less better by then. So, I put Windows 7 on my computer today. Man, that was a huge pain. It wouldn't install right at first, and then once we got it working, it took a bit for me to figure out how to customize stuff to my liking. I'm really picky about that, I guess. Everything was too big at first... Managed to make things smaller for the most part, but they still seem really far apart in some ways. Also Google Drive seems to have set itself up on my desktop and I'm not sure if that just came along with Chrome and I didn't notice, or what. One thing I guess I do like about Windows 7 versus Windows XP is that I can have a slideshow of pictures as my desktop background... I know I'm totally late to the game with this one but it was a pleasant surprise when I put a picture of my boyfriend and me as the background and it just started scrolling through a bunch of pictures of us together. Anyway, I've been reinstalling all my programs since then. I guess today's sort of been more eventful than usual. My friend called me earlier tonight, very upset. She was worried her dad was kicking her out of the house and cutting her off financially... I told her to come to my house and that she could stay here. She arrived sometime later, still pretty upset, and explained what had happened. I guess there was a lot of miscommunication between her and her dad, but in any case, we don't know exactly what's going to happen yet. She can stay at my house as long as she needs to, but hopefully this will be resolved before too long. I made her some food and set up a bed for her, and she kept saying she was sorry for imposing and that she would try not to stay here too long. I told her it was fine, but still, she was extremely apologetic. Not too long ago she kinda flaked on some plans we'd made to hang out, and I thought about that while I was making the bed. When she came over tonight she admitted that she'd bailed on me then to hang out with a guy she was seeing. Confessing that to me probably just made her feel more guilty. I told her it was okay, though, and I'd just appreciate it if she'd let me know earlier if she didn't want to hang out anymore. Not really sure if friend is the right word or not since we don't know each other thattttt well. "Acquaintance" doesn't seem exactly right either though. I'm not exactly sure what kind of social relationship we have. Friend of friend of a friend?? In any case it was interesting. He's a psych major too and we talked a bit about that, and about some other things like imposter syndrome and self-handicapping and whether it's possible for any given person to lead a happy life. He also apparently writes creatively, and was working on something involving superheroes during our conversation. My interest in superheroes is pretty close to zero, but he said he'd be interested in hearing about what I'm writing if I want to bounce ideas off him, so maybe that'll happen. We'll see. I had a very laid back New Year's Eve. Some family friends came over and we had cheese fondue, and my friend Gwenny gave me a very thoughtful, if... mildly preachy letter. I've really appreciated some of the things she's given me. I thought it was a nice short film. How strange, to think it's another year already. But then again, time always seems strange to me. I have no resolutions for 2015, but I think it's off to a decent start. After the movie we came back to my house and chatted for awhile. I showed them some of the things in my OKC folder, which is basically full of screenshots of amusing conversations and weird profiles and stuff, and we talked about all sorts of things. Vicky was mortified by some of the subjects, amusingly enough, and she sort of hid inside her jacket hood while the rest of us laughed. I was... disturbed by some of the other topics, but overall it was a good time. Alex seemed pretty tired towards the end of the night though, so Sean took both of them home a bit after midnight. I would've helped except that I probably would've gotten lost on the way back, since I don't have GPS and I seem to have developed a talent for getting lost when I'm driving.